I owned mostly every little thing of this anime and I still cherish it's amazing story. It was also really similar to pokemon which I also loved. When I was little I guess I wanted to be a duel-master because this show motivated to be a hero. So this anime earns a spot as one of my favorites and one of my most important memories. This has nothing to do with the show and more to do with Crunchyroll. I love the Yu-Gi-Oh series, watched the dub since I was a kid. I am really enjoying the subs so far as the dialogue is funny. While I will admit there are some errors here and there, it is to be expected from relying on translated subtitles. HOWEVER. What I don't understand is why the subbed series only ends at beginning portion of Waking the Dragons arc, which means that the last 68 episodes of the series are completely missing in the sub department. This, to me, is just baffling, considering the fact that they have all the episodes of GX, 5D's, Zexal and VRains both subbed and dubbed. Crunchyroll really needs to fix this. It's been quite some time since I watched this anime but even so I can still remember why it will always have a special place in my heart. The protagonist is a young boy, Yugi Mutou who, upon resolving the ancient Millennium Puzzle that it's said to grant whoever solves it a wish, gets possessed by the spirit residing inside it which will later be known as Yami Yugi(Dark Yugi). The spirit gets protective of Yugi, who is shy and easily bullied, and takes over the boy's body so that he could challenge those that dare threaten him to a Shadow Game, a dangerous game that has dire consequences for the loser. Any game can become a shadow game but the story itself revolves around a card game called Duel Monsters in which monsters are called forth to battle. As such there are many battle scenes to captivate the audience as we slowly discover the real plot which revolves around the mystery of the seven Millennium Items that seem to hold immense powers, Ancient Egypt and the real identity of Yami who slowly develops a desire to find out more about who he is and where he came from. I like how throughout the story the characters develop and evolve, bonds that are not easily broken are made and that the end clearly shows how far along Yugi came from that shy, weak boy he once was with the help of everyone around him but most of all Yami. 1. I watched the original, english subbed version so I have no idea about the 4kids version though I hear it's...something else. 2. The fact that I like the show doesn't mean I approve of its fashion sense. 3. It has 224 episodes. Can you say slow-paced and filler episodes? Well this is kinda akward. I love Yu-Gi-Oh. I even had a vast collection of the cards myself, including the three ORIGINAL God Cards. Though watching it again, now so long after, I realize how cheasy it is. Still love it though! And this part is just because I need more characters to publish my review. I am so glad this is finally on Crunchyroll, this beats the 4kids version hands down (or face down haha), I would recommend this to anyone who loved the 4Kids version and the card game. 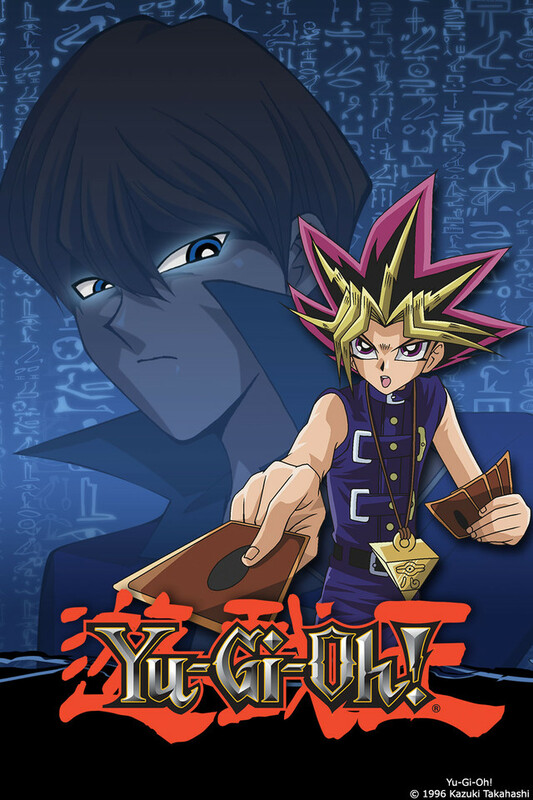 This series beats the other Yu-Gi-Oh Series without question. Watch the original king of games in action! I watched this anime as a kid, in the tv, but they kept jumbling the episodes, so you couldent keep track, i was so confuced, so when i saw that i could see it in corect order, and from scratch i couldn't wait to begin! I really love this anime! okay so I didn't watch yugioh as a kid so i feel like my review may be more accurate than others. I first watched the dub earlier this year, and even though it was cheesy, I really fell in love with the show. I always knew that they censored a lot of stuff (it was pretty obvious), so I wanted to check out the original japanese version. Even though I love the dub (I don't watch dubbed anime but the bad 4kids version is honestly the only one I'll watch), the japanese version is WAY better. There was a lot of plot holes in the dub and after watching the original show, it made way more sense and made me love the show even more. The only thing I don't really like about the show in general is there is so much filler. the first half of season three is probably my least favorite part of the show because it just cut right in between battle city, but it was pretty entertaining in the end. However, season 4 filler was pretty awesome. Okay but in the end I love this show, it has been my favorite anime all year long and i don't think I will find a better one any time soon. Most positive reviews are nostalgic. I loved this show when I was a kid but it definitely doesn't hold up as well today. I can only assume that the positive reviews are nothing more than nostalgia as it has some of the cheesiest and predictable writing in it and battles seems more stretched out than dbz. Obviously it's isn't true in a sense of time but due to the explanation of every single card that's played even though he just used it earlier, Spoiler I know pot of greed lets you draw 2 cards. In the Netherlands for some reason only season 2 & 3 aired on tv. And season 1 was only to be found on DVD. So I Always wanted to fill in the missing part that I missed form season 1 till even after season 3. Now that I watched everything I have to see its a great story with alot of suprises on the way. One down site is that sometime it felt like they where just delaying and delaying and delaying the main story. I'm head over heels crazy about anything and everything about Yugioh. Watching Yugioh I fell in love with Ancient Egypt all over again. Yami is the reason I started my all time favorite hot anime guys and Yugi same but with my all time favorite cute anime guys. Along with righting fanfiction and pairing shipping for the show. I have almost the whole English Yugioh and some of the Japanese ones. I'm really happy the Japanese Yugioh on here says Yugi in the anime and not game when their talking about cute little Yugi.